On World Lung Cancer Day, the American Thoracic Society, alongside members of the Forum of International Respiratory Societies (FIRS) commemorate and support those impacted by lung cancer. FIRS continues to support the grassroots efforts of the lung cancer community to raise awareness about lung cancer and its global impact, creating an educational movement around the world of understanding about lung cancer risks as well as the importance of early treatment. Lung cancer is the most common cancer worldwide, accounting for 1.8 million new cases in 2012. Along with trachea and bronchus cancers, lung cancer claimed 1.7 million deaths in 2016. It is also responsible for nearly one in five cancer deaths according to the World Health Organization. Lung cancer claims more lives yearly than breast, colon and prostate cancers combined. According to the American Cancer Society, an estimated 234,030 new cases of lung cancer are expected to be diagnosed in 2018. World Lung Cancer Day 2018 is a great opportunity for us all to highlight the many lung cancer risk factors in order to to help ensure early detection. While most understand that smoking is the single greatest risk factor for lung cancer, other lesser-known risk factors include environment and genetics. 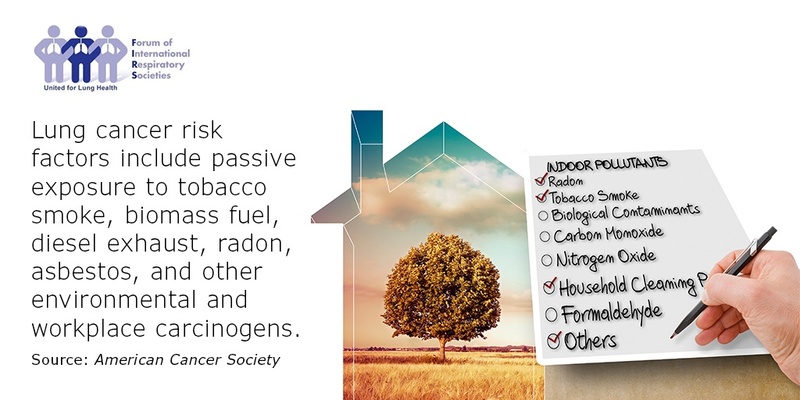 Environmental exposure to radon, asbestos, arsenic, beryllium and uranium have all been linked to lung cancer. The risk of lung cancer also increases with a history of cancer in another part of the body, age, family history, radiation to the chest area and lung diseases like COPD. FIRS would also like to highlight key symptoms and screening options. Symptoms include change in mucus, chest or back pain, coughing up blood and difficulty swallowing. Tests that may be used to diagnose lung cancer include chest X-rays, CT and PET scans, bronchoscopy and needle biopsies. If you are a current or former smoker and over the age of 55, you may be a candidate for a low-dose CT scan screening that can potentially detect lung cancer in its earliest stages. “World Lung Cancer Day efforts continue to raise awareness of risks and increase early detection for the best possible outcomes. Treatment options for lung cancer have significantly advanced over the past few years and survival rates are increasing,” said Polly Parsons, MD, president of the American Thoracic Society.